Rugged highland terrain on the farside of the Moon, south of Cantor crater. Image width is ~3.4 kilometers. Close-up view on the lunar farside south of Cantor crater (38.2°N, 118.6°E) taken at sunset (incidence angle 87°). Although the pronounced shadows hide the interiors of craters, the high incidence angle exaggerates the surrounding terrain so that subtle surface features are enhanced. In these lighting conditions, the Moon looks pulverized, softened, and pock-marked with craters of variable sizes and relative ages. Some craters are very bright and have well-defined rims while others are barely noticeable as shallow depressions. The large number of craters influence the texture of the surface as the impact process removes material from the site of impact and transports it as ejecta onto the surrounding surface. The redistribution of ejecta material churns up the regolith (a process called impact gardening), smoothing the surface and filling in older craters. 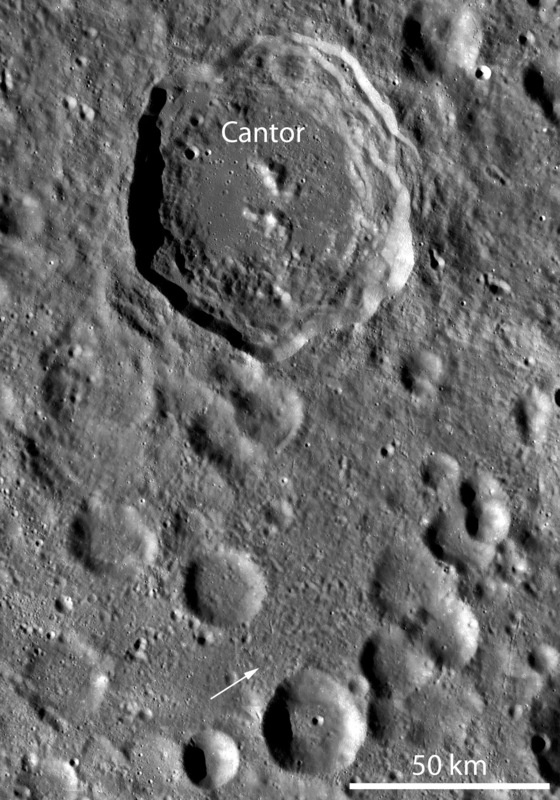 While there are many small craters (<100 m in diameter) visible in this image, there are also much larger craters (hundreds to thousands of meters in diameter, such as the crater rim visible near the bottom of the full NAC image) in the vicinity of Cantor that are responsible for a significant redistribution of material. The surface in this NAC frame suggests that both the craters visible in this frame and those surrounding Cantor are responsible for the much of the surface texture we observe.